is mounted below the switch. that would cost over $300. We won't assist in disabling a safety feature. You can get the park lock solenoid for around $70 at the dealer. You might have to reroute the harness because they changed the design of it. Oh I never thought this was a safety feature. do not want to disable a safety feature. If not I will test with a voltage meter the wires to the ignition solenoid actuator. the shifter solenoid is not completing the ground cicuit when the vehicle is in park. just bypass the solenoid. Now I realize I need to fix the problem. It prevents you from locking the steering wheel while underway. No its got a shifter in the console. That diagram was for a column shift. 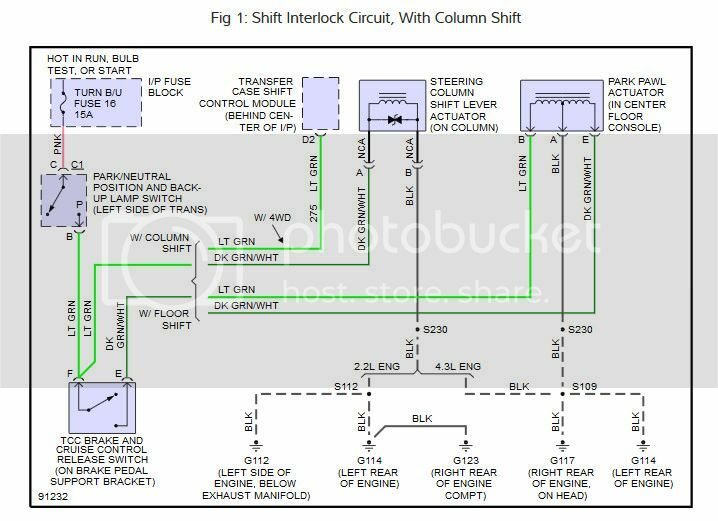 This one is the floor shift for the shift interlock. This may or may not be what you need. and just have to figure stuff out logically. that could be defective causing my problem. shifter. It is grounded all the time to the engine. This is very helpful. has broke the wire internally. grounded. I was wrong in thinking it was ground by the console shifter solenoid. I can check them....Thanks again. I don't know if you are just processing all possible scenarios or making this a lot more complicated that it needs to be. Your first step should be to just determine whether it's ground or power that is missing from the solenoid when this doesn't work. Then you have only one path to follow. You could find out neither is missing and the solenoid itself is bad too.